Super Hard 12% Antimony/Lead alloy! Up to 5 times as hard as standard Lead media. This media is custom made with an unheard of 12% Antimony mixed with Lead resulting in an extremely hard alloy. As a result, the media will last far longer in the mill and offers reduced contamination to the material you are milling. Approximately 1/2" diameter, completely non-sparking & ideal for making Black Powder. 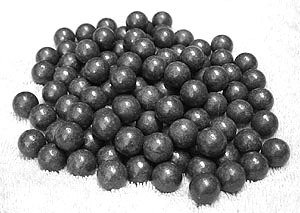 This heavy & highly efficient grinding media is perfect for use in any table top Ball Mill or increase the grinding efficiency of your existing mill by adding additional balls.